It's a mild but typically gray and “squishy” winter day in Everett, Washington, and here at Snohomish County Airport—which is better known as Paine Field—conditions are strictly IFR. Right now you're standing by the window in the WashAir pilot's lounge, gazing out at the wet pavement and dark, gloomy sky as you ponder a move to Arizona. Then you note the time, bring yourself back to the present, and turn to get a final update on the weather. It's hardly necessary, of course: There's little wind, but there's a solid ceiling at around 2000 feet throughout the area with occasional light rain—as usual. You shrug it all off and head for the gate. You're a senior pilot with WashAir, a local commuter airline, and you're scheduled for the noon departure of WashAir 201, the southbound commuter to Seattle. The stop at Seattle will be brief as you'll be departing again, almost at once, to continue on to Olympia. Shortly after arrival at Olympia, you'll turn around to return to Everett/Paine Field with the same equipment and crew, this time as northbound Flight 202, again stopping at Seattle on the way. The weather details are indelibly imprinted in your mind—conditions have scarcely changed for days. The front office takes care of your flight plan, the flight is too simple and familiar to require a log, and the clearance routing for this first leg to Seattle-Tacoma International is invariably just “Direct to the Seattle VOR.” In fact, you scarcely reach your cruising altitude before they start bringing you down again for the approach to the airport. Then hold on 29 at the first runway intersection. Then turn right onto the northbound taxi strip. Contact Paine Tower on one twenty-one point three so long. 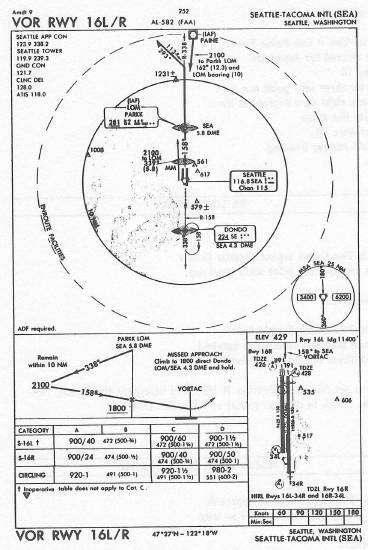 You set Nav 1 to Seattle, R-158, and intercept the radial, noting that Parkk is on that radial at 5.8 miles DME. On one twenty-three point niner so long. Expect VOR approach to Runway 16 Left. On one one niner point niner good day. Then ground on one twenty-one point seven bye now. That's straight ahead and just to your left.